Military, Police and Fire Department and Coast Guard personnel. Thank you for your service! And -5% Repeat Renters Discount. Discounted rates do not include pool heat fees (optional) or taxes. Base Rates do not include Optional pool heat fees ( $350 Week) discounted for additional weeks, days, Insurance or taxes. There so much to explore and to do here besides the beach and fishing. So search online for Apalachicola Chamber of Commerce or Franklin Co FL for monthly area events. An Angels Dream is private, has great views of the beautiful Gulf of Mexico and is conveniently located on a short dedicated path to the beach. No traffic & " No streets to cross." It's the little things that make a big difference! Our house is stocked with a starter supply of consumable items, including coffee filters, hand soap, paper towels, toilet paper, dishwasher soap & garbage bags. We have a full size refrigerator on the ground level Summer Kitchen. It's easy for you to unload all those cold groceries and bring them up as needed. Also a small dorm fridge for on hand drinks. For your convenience we have under house carport with Key-less door entry. You simply check in & check out with your personal door code available via email from Resort Vacation Properties, located 6 miles from the house... Less planning for you, more time enjoying your vacation. You can easily unload your cold groceries and drinks directly into the full size Refrigerator/ Freezer on ground level in the screened Summer Kitchen for outdoor cooking & dining. Most groceries, condiments, and cleaning supplies are available on the Island or in Apalachicola, but you might want to bring aluminum foil, plastic wraps, sandwich bags & laundry detergent. Remember medications or any bath products of which you’re especially fond of. The Island Grocery has a good meat market/veggies & a variety of barbecue & smoked meats usually ready around 5pm BUT I urge you place orders in advance. An Angel's Dream is 4 miles inside the Beautiful St George Island Plantation and is located on a dedicated beach path that is less than a 3 minute walk to the beach with no streets to cross. Beach Bocce Ball & Corn toss games & extra propane gas for the grill also available under the carport stairs. *We participate in the St. George Plantation amenities program, including additional two community pools, 2 tennis & 2 pickleball courts, the Plantation Clubhouse & fitness center, nature trails, access to Bob Sikes Cut, & more. Please note: At this time: Golf Carts are not allowed with rentals in the Plantation but you may rent & use golf carts outside of the Plantation. The pool is screened, private, 12 x 33 & can be heated for a fee. ($350 October-May) Extra days $30. The pool has massage jetted seats & night lighting. Cook on either the gas or charcoal grills then dine in the large outdoor screened room adjacent to the pool . Convenient full size Refrigerator/freezer & a dorm size fridge for easy to grab drinks. Dinning table, extra chairs, a couch, Bar, blender & ceiling fans. Adjacent to the Screened Dining room is the Screened Pool & Hot/Cold outdoor shower: fish cleaning/ dinner prep sink, under house carport with a pool side deck & Comfortable Sofa, Club Chairs & 2 Chaise Lounges. The living room has a 55” Roku TV... Satellite DirecTV with many Sports Channels, HBO, Show Time, TMC, NetFlix, Pandora, Hulu, Amazon, HBO on the Go are all available with your personal account ...All Bedrooms have 43", Roku TVs: with guest personal account. Many TV APPS: Satellite DirecTV , BlueRay DVD player. All Bedrooms have new pillow top mattresses. All beds will be made for your arrival. Towels & soaps on each bed. Extra towels are available no charge through housekeeping. The first floor has 3 Bedrooms that all open out to a huge covered porch comfortably furnished with deep seating: 3 seat LazyBoy couch, club chairs, dining table & chairs, over sized chaise lounge & bar. This large covered porch is perfect for entertaining or relaxing, as comfortable as a second living room. The first floor: #1 Master King Suite opens out to the large covered porch... 43” Roku Tv; Blue-Ray player: Telephone, Coffee Maker & Kurig: Iron. A Jetted Jacuzzi Bathtub; Double Sinks; Wall Mounted Hair Dryer & Separate Toilet. Opens to the large covered porch; 43” RokuTV/LCD Telephone: Coffee Maker & Kurig, Hall Bathroom with Double Sinks, Wall Hairdryer; Separate Toilet, Tub & Shower. The top floor is a large open great room with views of the Gulf of Mexico & overlooks your 12x33 private swimming pool. The Kitchen has many handy small appliances & tools for any chef or baker, dinning table with large comfortable chairs. Laundry room & a guest bathroom & shower. The Living room has 2 large couches, 2 comfortable recliners & a 55” LCD ROKU Smart TV, Satellite DirecTV. (Available with your account) Netflix, Amazon, Pandora, HBO on the Go & many more apps. Free WiFi & Local phone calls & most Long Distance Telephone Calls are free. A bonus room off the living room with a sleeper sofa with Gulf view. Adjacent to the great room Is a guest Bathroom with Toilet, Sink, Walk in Shower and Hair Dryer. Both Master King Bedrooms have new eurotop mattress , 43” Roku TVs. Open to porch Overlooking the private Pool & great views. Master Bathrooms have Double Sinks, a Kurig, Wall Mounted Hair Dryers & a Jacuzzi Jetted Bathtub. All 4 bathrooms have wall mounted hairdryers. 43” LCD/HD Roku TVs & BlueRay players, Telephones, Coffee Makers or Keurigs & all open to a porch. We gladly make guest suggested improvements. Like the new mattresses, extra towels, linens, recliners & our ground level refrigerators. We truly appreciate you helping us know what needs our attention...We do our very best to have everything clean & in good operating condition for you, the next guests & for us too. Outside: We have 10 or more complimentary beach chairs that fold for sitting or laying down & over the shoulder camp chairs with pull up shades. Refer to your travel insurance papers & or our local management Co. Resort Vacation Properties cancellation policy details on the paperwork. Please email or call for details. Please obey the leash laws, pick up and properly dispose all dog waste. New reservations only: unless specified may not be combined with additional discounts. 3 N minimum $1743... Extra nights $442. 3 N Minimum $1407... Extra Nights $358. Not applicable with other specials unless specified. We love this open house and It's private location to the beach. There is no one in your space... And it's a plus to be situated on the short beach path. No streets to cross...and No way to get lost. We provide a complimentary beach/fishing cart and chairs that easily carries everything needed for the short walk to the beach.... After a day at the beach, the swimming pool and comfort of the house is there waiting with open arms. There's lots of room to nap on many a couch & lounge chairs or glide into the sweet water of the pool. The swimming pool can be heated and for me being a creature of comfort that's a winner. Remember our Winters are short and the Spring and Fall are long. Its the perfect time to have the swimming pool heated. We loved the colorful tile and views from the great room and the fact that our family has plenty of room to spread out yet be close together... for games, puzzles and a great movie through the Roku Smart TVs. We often dine or play games in the large screened room under the house. There is a full size refrigerator, table, chairs and a bar. The Plantation it self is a nature wonderland for those who love to explore the outdoors. The island has no big chain stores but there is a Piggly Wiggly grocery in the gas station. The Plantation beach is unspoiled, clean and is a quiet family beach... The wild life and fishing is simply amazing. May to November we've had the wonderful experience of witnessing turtles lay their eggs on the beach and dozens of other incredible encounters with dolphin and other wild life... In Winter & Spring we've seen pods of Dolphins swimming in the thousands, "as far as my eyes could see"... Late Summer and Fall the amazing site of watching Dolphins play with the cannonball jelly fish (no they don't sting) but they are a wonderful food source, high in protein. You won't believe the number of different types of wildlife we see on a daily basis. The covered porch is very large and comfortable. It's easy to take a nap, read a book or dine outdoors. Our grand kids learned to swim in the pool at An Angel's Dream and its so easy to keep an eye on them from any level of the house. The house and beach is a great place for our children and grandchildren to be free of the rigors from school and or work. They bike everywhere, freely exploring the natural beauty of our island. This is the place where we can reconnect with the simple life, explore and be in touch with nature and our family... Build sand castles, watch the wild life, play board games, puzzles and gather in the kitchen... St George Island Plantation has miles and miles of bike paths,. From the Cut to nearly the other end of the island... The waters are considered world class salt water fishing... 3 tennis courts, an awesome club house and an exercise room . In addition to our private swimming pool there are 2 Plantation swimming pools. There is so much to do you will want to stay longer just to finish that book you brought. Spend a little time over in Historic Apalachicola. A lovely turn of the 19 century town. Good restaurants a micro brewery and lots of shopping... Some walk around some bike and you can even rent a golf cart. Let us know what you liked about our house, the island and lovely Apalachicola. Ya'll come back now, ya hear? toilet, combination tub/shower, Double sinks, pocket door separates toilet from vanity. toilet, shower, Pedestal sink, walk in shower. Gated and guarded 24/7... designed with respect to the wildlife. Miles of bike and walking paths. several dedicated bird sanctuaries. kayak and canoe launch sites. 4 tennis courts. (5) FREE local and long distance to most cities. Many overseas included...1 answering machine in MB Easy Check-in and Check-Out by phone. Double carport bay; plenty of additional parking in driveway. 2 Sets per Bedroom, 2 on sofa bed. And extra towels in upstairs Master Bedroom Closet or call housekeeping for additional towels. Located at Plantation Club House. Must be 18 sign a waiver and have a visitors code to enter. Free open access WiFi, can be used in any room and Poolside. Large open plan upstairs, living room, dining room, kitchen and an additional room with a sofa bed. 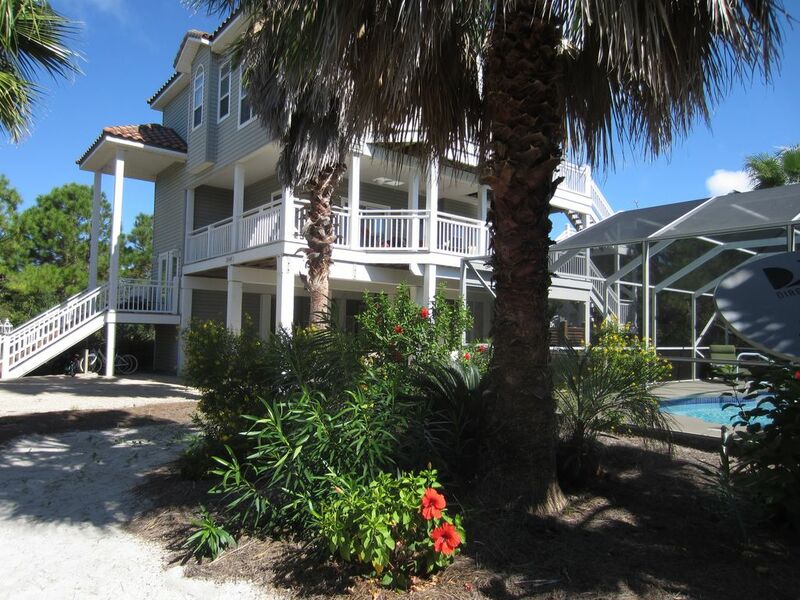 Opens to deck with Gulf views overlooking the private swimming pool. Coffee Maker and Kurig in Kitchen; Cuisenart Coffee Grinder; additional coffee maker... Kurigs in Bedrooms, Electric water kettle. Dinner Dishes; More than adequate Serving dishes and tableware. Many small specialty appliances. Gas, charcoal and an indoor electric grill. Corn Toss and Bocci Ball... Many Games and Puzzles; Balderdash, Scrabble, Who Said That, Trivia, Skip Bo; Backgammon, Monopoly, Disney Headbands, Farkle; Blokus; Sumoku and Many Puzzles. Tropical landscaping, Palm trees, cycads, aloe, papyrus, hibiscus and oleander , pampas grass, muhley grass. Available at Journeys and several other near by shops. Will deliver to the house or take a guided trip. Plenty of Comfortable Upscale Furniture. Bar for Entertaining. Opens to 3 of the Bedrooms and is Gated. This property has everything you need! Comfortable bed, outdoor furniture, pool was great, easy beach access, beach cart, chairs and umbrella for the beach was wonderful, bikes for ride in the mornings, kitchen had everything we needed...would come again! Wonderful home, Wonderful owners, really an amazing vacation, we will be back! We’re delighted to hear that you were happy with our house and amenities. Knowing you will be back only encourages us to make our house the best it can be. Well equipped, plenty of rooms for 10 people. Owners are wonderful. Thank you K... We are glad you enjoyed your family vacation. I hope you will return for another vacation and a repeat guest discount. D.
We loved our second visit to An Angel's Dream! This is our second year in a row returning to St. George Island and An Angel's Dream. We love the location, the private heated pool, the short walk to the beach and the overall privacy. Great home in a great location! Thank you for returning again this year for your family vacation. Each year we update and improve our Angel’s Dream with suggestions that our guests provide. We appreciate our repeat guests. Please come again. Wonderful place to chill. The house was cozy, clean, comfortable and quiet. I have never stayed in a place with such a well equipped kitchen. Everything was great. A short walk down and you are at the beach. We took advantage of the bicycles provided to check out the extensive trails in the plantation. The owner was very accommodating and really cared about our comfort. Thank you Deborah! You are so welcome. Please come again and receive a -5% repeat renters discount. Awesome Thanksgiving at "Angels Dream"
Words cannot express our experience at Angels Dream this Thanksgiving. We recently sold our home outside Atlanta, wanted to spend Thanksgiving at St. George Island and invite our family. What an unexpected treasure we found at Angels Dream. We planned for 10 family members and ended up with 6 but what a time we had. The house was immaculate!!! It was spacious, clean and had everything anyone could ask for (we served up a fantastic Thanksgiving family feast). We enjoyed all the extra amenities (bikes, puzzles, etc.) as well as the very unexpected welcome gifts/goodies when we arrived. Everything was awesome!!! We witnessed the most beautiful sunset on Saturday, 11/25 (pic's and video were taken). The owners (Mr. and Mrs. Lang) are always quick to reply with any questions you may have. This was a holiday vacation that will stay with you forever!!! You cannot go wrong with Angels Dream!!!!!!! We are delighted to hear that your first trip to St George Island was a pleasant visit. Please come again. We enjoy having repeat guests. Full payment is due if booked less than 30 days prior to arrival...Cancellation Policy: Cancellations/Changes to Reservations: Once the reservation deposit has been received, there will be no refunds issued unless: 1. We can re-rent the home for the same dates & rental rate. A 10% cancellation fee of the total rental amount will apply & be deducted from the advance rental payment. If it is not possible to re-rent the home for the same dates & rental rate, the 10% cancellation fee & any difference in the re-booking rate will apply. If the home remains vacant for those dates, the entire deposit will be forfeited or the reservation may be reinstated; 2. Guests are welcome to change their vacation dates if the new dates are for the same home/calendar year & the rates are of equal or greater value. In these circumstances, we must be contacted at least 30 days prior to arrival; 3. After arrival, there should be no expectation of refunds or relocation because of dissatisfaction with the home rented. Unlike a hotel, we cannot relocate guests. We use a local St George Island company for all Rental Agreements & Payments, Travel Insurance, Maintenance and Housekeeping. Please call 850 321-5534 for more details & instructions... 2 dogs are free. We require $50. Per additional dog. Dog parents are required to keep furniture free of pet fur/hair etc. Kindly bring all pet personals and blankets for our furniture. "Housekeepers will charge extra (IF) to clean after your pet and you will be billed the extra amount." accordingly. We kindly ask you to pick up in the yard after your pet. The Plantation and county ordinance require you to pick up all pet refuse. This requirement will assure us to keep our house and yard, the beach, the restaurants and the Island pet friendly. Please read Resorts rental agreement.